Erin just cleared everything, made me a new login/password and confirmed she could login. Then everything worked like it should. Thanks for the post! I don’t think I have another log in. 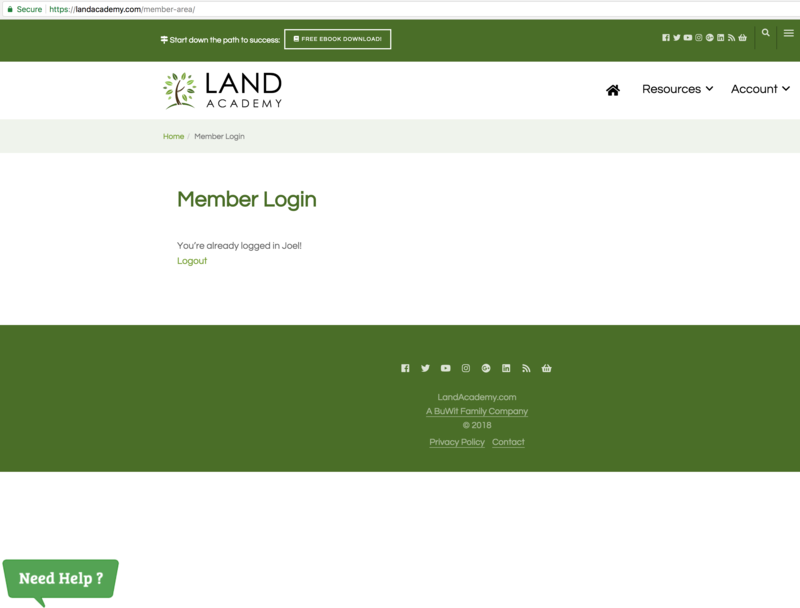 The only other email I have used with landacademy shows no login found when I click on the Forgot Password link. @aillon I don’t see any tools icon, with gears. Do you see it in the image I posted? Erin asked that I clear cache and cookies and try again, but this didn’t work for me. Also I have tried multiple browsers. Maybe you could just send him the deed worded as he is the owner without mentioning the wife. Then he could sit on the deed until the divorce is final. I’m not entirely sure this is legit but may be an option. I would think the sellers need to trust you a lot to sign your deed, which gives you the property, without being paid until county recording. If you can get away with it, more power to you. Just got the K-1 from the LLC and sent a reply to your email. Isn’t a K-1 supposed to go out only for income received and losses? You are doing fine on YouTube, it looks like your shed is already a recording studio. Just left you a msg on your answering machine, check your PMs here and email too. Check your gmail email or PMs on here. Thanks! @espence When were those email updates sent out? I only see in the email from 5 days ago that “Monthly live webinar/coaching call with Jack & Jill” is mentioned in the newest LandAcademy “CRAZY SPECIAL” email. But the last mention on another email I got was 22 Dec where it stated, “Calls will resume on January 11th, 2018. But thanks for making this post! I think Jack talked about how he used eBay when he first started out. Now PayPal will shut down your account if they see you are selling real estate, it is against their rules. Of course that doesn’t stop people from selling on eBay, but it is risky to do it. I had the same, but I didn’t catch it for my mailer. That brought a bit of haight. Now it looks like Deedperfect won’t let you enter Grantor information. It asks me to choose between Individual or Entity then when I select Individual it shows “Number of Individuals” but there is no box to enter the number or any other Grantor info further, for the entire form. Any updates on the fixes?